Plan Ahead. If you decide what to cook early, have all ingredients on hand and cook some of the meal ahead of time — you can save yourself a lot of stress. Also, cleaning the house a week ahead of time frees you up to focus on meal preparation and takes pressure off as the big day approaches. Simplify Cooking. If you can take shortcuts, take them. Bake your turkey in a plastic bag, which keeps it moist as it cooks and makes clean-up easier. Opt for instant mashed potatoes, pre-cut green beans and pie from the store. Unless you derive great personal satisfaction from cooking something exquisite (and time-consuming), people will enjoy the short-cut food more if it means you’re more relaxed during the meal. Cut Down On Food. If you’re cooking for only a few people, you may consider cooking a turkey breast — rather than the whole bird — to save time and energy. Turkey breasts cook more quickly, take less preparation, leave no carcass behind, feed several people and supply delicious white meat, which is lower in fat. While it’s fun to have leftovers, if the idea of turkey soup and turkey sandwiches for the next two weeks doesn’t appeal, this is a good place to simplify. Try Fewer Side Dishes. It’s a lot of fun to have a feast, and there are many creative recipes this time of year. If you cut down on side dishes, though, you can save yourself quite a bit of time and effort. Just pick a vegetable or two with rolls, and make a lot of them. This way, while there’s less variety, there’s plenty of food. Bonus: This may make people less likely to stuff themselves and regret it later. Let Others Help. Another fun way to simplify your meal is to let others help with the side dishes. 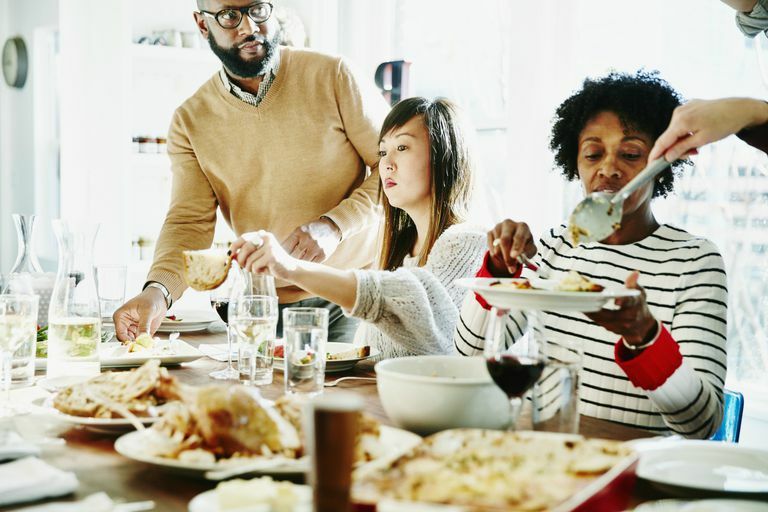 If you’re having other people come, you can just let everyone bring a side dish or dessert while you supply the turkey. If you’re only cooking for your own household, you can let everyone in the house be responsible for one side. This lets everyone feel good that they’ve contributed to the joy of the feast. Get Take-Out. If all of this sounds too complicated, there’s an even simpler way. Many restaurants and even grocery stores are beginning to offer pre-cooked holiday feasts. All you do is pick up a cooked turkey or ham (which can be reheated and served when you choose) and several side dishes. This is a great solution for those who want a traditional meal for their holiday celebration, but simply don’t have the time or ability to cook one. Setting a simple table—paper napkins, food as a centerpiece, etc.—can also help. Remember that the important part of the celebration is the people you're with, not the menu. You can also simplify meals by practicing stress management techniques. If you're looking for some great holiday recipes, you can visit Verywell's low carb diets site or nutrition site.